Abnormal circadian activity in HD patients. A, Actimetry monitored over 48 hr in representative subjects show data from a neurologically normal control (top), an HD patient with an independence score of 90% (patient 2, middle), and an HD patient with an independence score of 60% (patient 10, bottom). Group activity measures for patients, normal controls, and carers (plotted as mean ± SEM) are shown for daytime activity (B), nighttime activity (C), total activity (D) over 24 hr, and night/day activity ratios (E). *p < 0.05; **p < 0.01. Disruption of circadian activity patterns in R6/2 mice. Representative double-plotted actograms of continuous recordings of a WT (left) and R6/2 (right) mice monitored from 8 to 16 weeks of age, under a LD photoschedule (A). Representative actograms from a second study showing activity cycles of mice recorded for 1 week under LD from 6-7 weeks (B) or 14-15 weeks (C) of age. 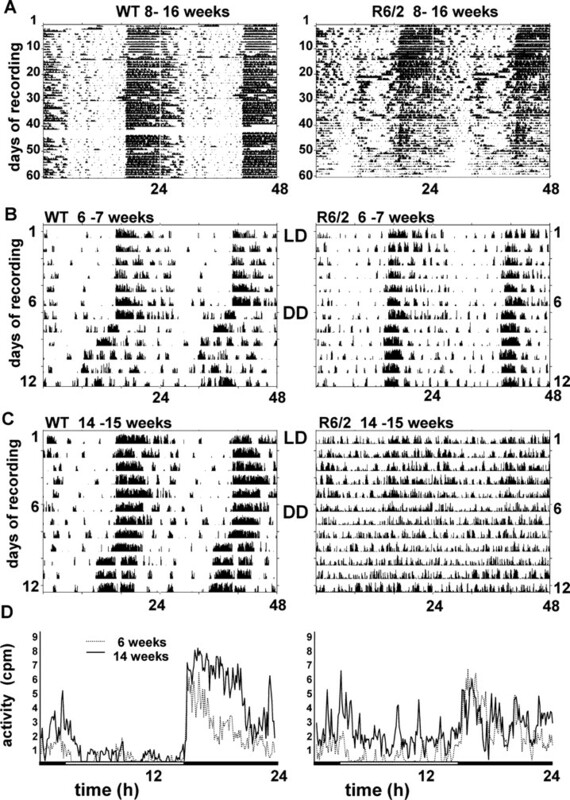 Mice were transferred to DD at 7 or 15 weeks of age, and their activity was recorded for an additional 7 d. Representative 24 hr activity profiles (averaged counts over 7 d of recording under LD) of an individual WT (left panels) and R6/2 (right panels) mice recorded over weeks 6-7 (gray) and weeks 14-15 (black) (D). Increased daytime activity and impaired circadian control over rest-activity cycle in R6/2 mice. A, Daytime (white columns) and nighttime (black columns) activity levels in WT (n = 8) and R6/2 (n = 16) mice recorded for 7 d at 6 and 14 weeks of age on an LD schedule. B, Daytime activity measured as a fraction of total activity in WT (white columns) and R6/2 (gray columns) mice at 6 and 14 weeks of age. C, Amplitude of χ2 periodogram of peak circadian periodicity (22-26 hr) measured in free-running WT (white columns) and R6/2 (gray columns) mice at 7 and 15 weeks of age. All data are mean ± SEM; **p < 0.01; post hoc Dunnett's t test. ns, Not significant. 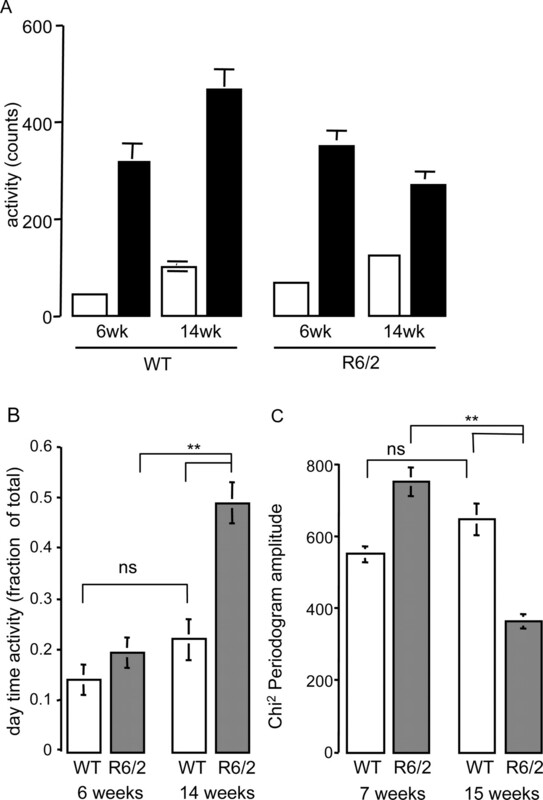 Impaired circadian gene expression in SCN of R6/2 mouse. Representative images and corresponding semiquantitative analysis of in situ hybridization for mPer2 (A), mBmal1 (B), and mPK2 (C) in SCN and mPer2 in motor cortex and striatum (D). Tissue was taken from 16-week-old WT (filled symbols) and R6/2 (open symbols) mice. Mice were killed at 6 hr intervals over one 24 hr period in the second cycle after release to DD. 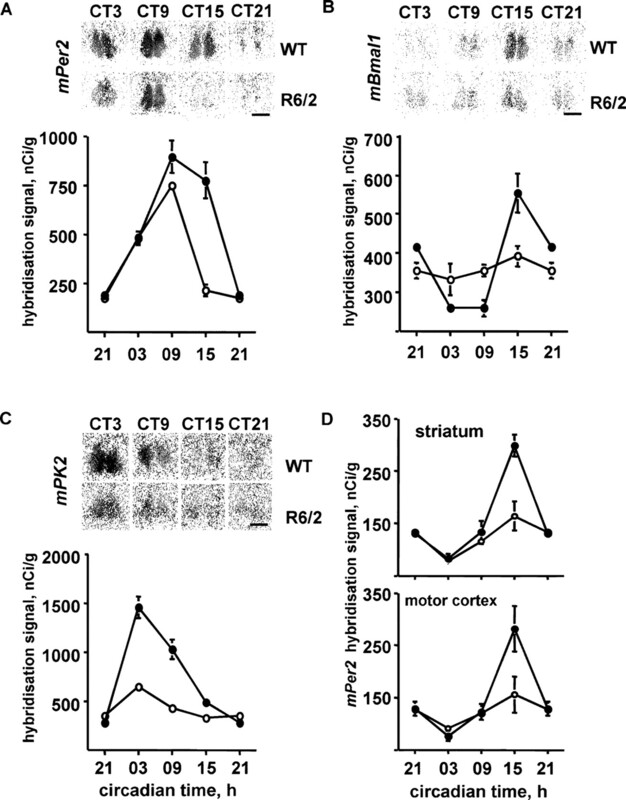 Note that data for CT21 are double plotted for clarity. All data are mean ± SEM. Scale bar, 500 μm. ↵ a Mean age of patients, 49.4 ± 4.2; mean age of controls, 52.9 ± 4.3; t(14) = 0.414, NS. Cont, Control; F, female; M, male.